This painting was painted around 30 years after and Leonardo Da Vinci starts painting the "Mona Lisa" and Nostradamus is born. 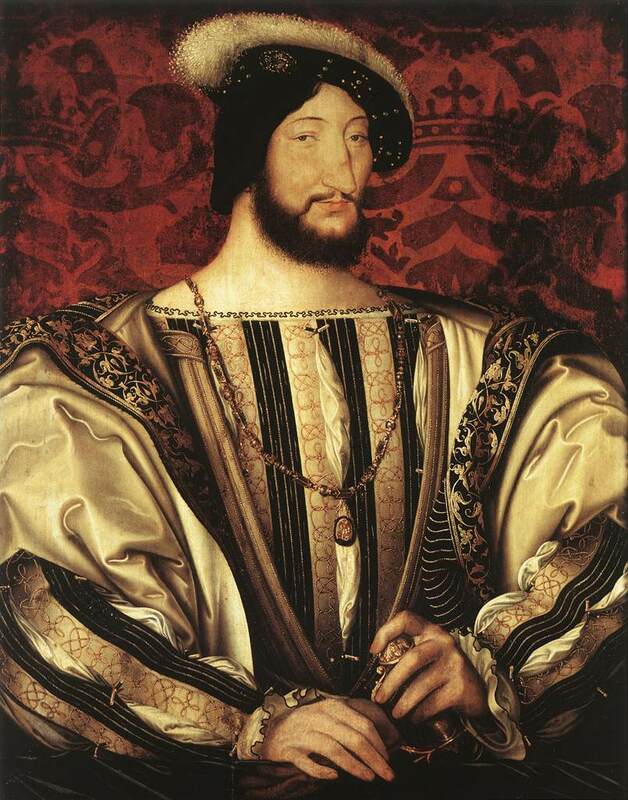 Jean Clouet painted this magnificent piece of king Francois I. Guess which painting influenced this one? The Mona Lisa. Now gaze into the king's eyes... look at his enigmatic smile... It was no coincidence, the king was a great patron of the arts and invited Da Vinci to hang with him. Da Vinci brought all his paintings with him to France, including the Mona Lisa, which the king later acquired. Fun fact: King Frankie's wearing a medal that shows that he's the grandmaster of the Order of St. Michel, a pretty exclusive club, which was about loyalty to the King. So the dude was the head of an order that was about loyalty to himself! LOL fact: This painting was influenced by that of a guy named Jean Fouquet. That's not pronounced "Fu** it!" Fun facts. This was made around the time that Columbus discovered America but thought he'd reached India. No chutney for him. America was named for Amerigo Vespucci instead. Amerigo's cousin (name?) is the guy who identified the model for the Mona Lisa, who herself was a teenage mum with 5 kids.